Very good thing for all WordPress users is that fresh installation or migration to the new 2.9 version from any previous WordPress version is very easy. Just do not forget to look at readme.html file from the WordPress installation package. You will find there the answers on questions about installation, update/upgrade process, if you have it. Before to start the upgrade procedure make a full backup of your blog data: database and WordPress files. If you have a question about backup procedure, visit this page first. 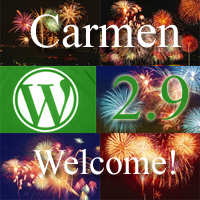 In order to update your current WordPress installation to the new 2.9 “Carmen” version of WordPress in the full automated mode just click the link “WordPress 2.9 is available! Please update now.” at the top of your blog admin dashboard. Such link will appear after a couple of minutes after your login to the admin back-end. After click on this link WordPress offers to upgrade automatically or download WordPress installation package and install a new WordPress version manually. That’s all. After click on “Upgrade Automatically” link you need to wait a minute, all the rest job WordPress will make for you itself. Important: Do not touch wp-config.php, .htaccess and all other files you added to the WordPress installation folder or changed yourself. You can left “AS IS” your wp-content directory too. It contains your popular WordPress plugins and possibly your customised WordPress themes. So it is not the good idea to delete them by own hands during upgrade process, right? If this was happend somehow, remember – you have the backup copy and can restore lost files. You didn’t make the backup before start the upgrade? All that backup requirements are for newbies who don’t know what they do? Hm-m… May be you are not right now? :). 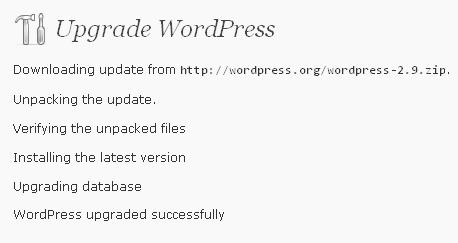 Click “Upgrade WordPress database” button. Then you will see “Database upgrade complete” screen. do not pay attention, click “Continue” button again. That’s all. You finished upgrade procedure successfully. This entry was posted on Saturday, December 19th, 2009 at 05:58	and is filed under WordPress. You can follow any responses to this entry through the RSS 2.0 feed. You can skip to the end and leave a response. Pinging is currently not allowed.